The section of the south side of the High Road, between Union Street and Willoughby Street was typical of much of the Road as a whole, in that it became fully dedicated to retail shopping in the second half of the 19th Century when it added a block specifically built for that purpose and the frontage of any existing buildings - which had been associated with the agricultural land which had abutted the street until well into that century - was largely converted to shop use. Our story will explore this transition and tell the story of the personalities who lived and traded in this central part of the High Road. This photograph, dated from about 1910, shows the frontage onto the High Road, between Union Street (just off the right-hand extremity of the picture) and Willoughby Street (which may be seen near the centre of the picture, where the lady is shown stepping into the road). The individual properties, right to left, were then numbered 64,66, 68 & 70 but had been 30,32,34 & 36 respectively before the renumbering of the High Road in 1908 1. On the opposite side of High Road, is the junction with Stoney Street, flanked either side by Paling's greengrocery and Bailey's butchers shop. Alongside the group of perhaps slightly apprehensive children, a sandwich-board man has appeared, appropriately dressed as a shepherd - as he is advertising bargains at Shepherds grocery shop, back along the High Road between Acacia Walk and Station Road. By this date, this frontage was fully developed but, in common with most of the south side of the High Road, it had seen a complete transformation over the previous hundred years. 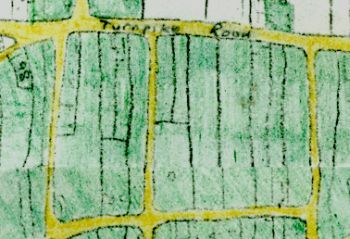 At the time of the Enclosure in 1809 2, that side of what was then the Nottingham to Sawley Turnpike was essentially open pasture made up of crofts, running between there and what is now Middle Street, which had (in contrast to the surrounding open fields now the subject of the enclosure) been individually owned for centuries. These crofts can be clearly seen on the section of the Enclosure Award map shown here. Any buildings that did then exist were cottages and simple buildings to support farming activities and craftsmen who, in turn, supported them. 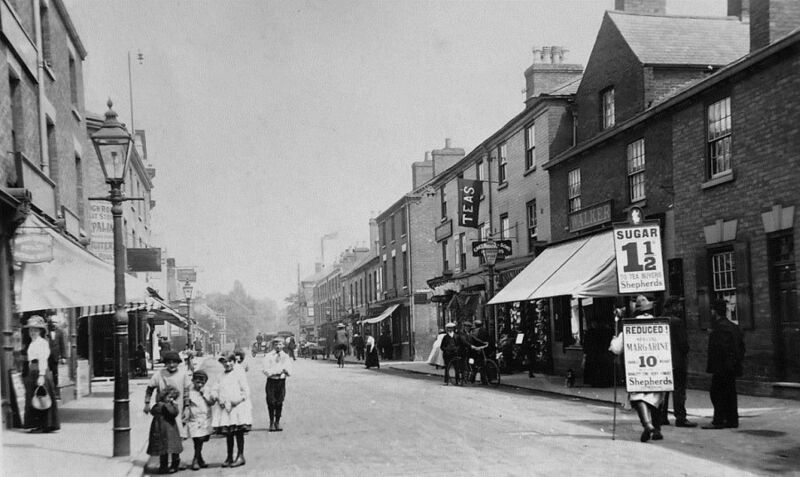 64 (previously 30) High Road - It was in this stretch, on the site of the larger building on the right, originally No. 30 but changed to No.64 when the High Road was renumbered in 1908, where John Walker traded as wheelwright up to his death in 1844. He was the third of five sons of William (c1760-1830) and Mary (née Thompson c1865-1838). William, it seems, farmed the remainder of croft at this location and this was continued by his second son, William (1789-1862) and this was continued by Joseph Walker (1806-1881), his youngest brother, after William junior's death. Thomas (c1787 - abt1860), their elder brother, worked as a lace maker. James, their second youngest brother (1804-1836), trained as a draper in Nottingham before his excessive drinking led to a downfall. This story, together with that of his eventual religious salvation before his early death is told here. Like his parents and most of his brothers and their wives, he is buried in Beeston Churchyard where their memorials survive 3. John Walker and his wife Hannah 4 had two children. Elizabeth, their daughter, died aged only 22 in 1854 but their son, John (b.1836) went on to marry Louisa Moore, the eldest daughter of John & Susannah (née Newbold) 5 and eventually inherited the family home on the High Road and developed it to be the building we see in the picture, where he - and eventually most of his family - were to trade as drapers for more than fifty years. In fact, after Beeston was connected to a gas supply in 1861 5, John secured the position of collector of the gas rate, a position he held until his retirement after about forty years in the job. Despite, his parents and brothers' lifelong connection with the Parish Church, John and his family, like many Beeston people then and since, developed a strong adherence to the Methodist faith - in their case the Wesleyans - and, at one stage, around 1893, perhaps following the traditional Methodist 'self-help' tradition, John appears to have been involved in a private chapel-based school (the advert for tutors shown here is from October 1893 6 ). John is also known to have been a Sunday School teacher at the Wesleyan chapel, then on Chapel Street, Beeston 7. Louisa died in June 1906 followed by John in October 1914. They are buried in Beeston Cemetery where they are remembered as part of Louisa's parents, John & Susanna Moore's memorial 8. John and Louisa's two eldest sons, Harry (1859-1941) and Horace William Walker (1860-1943), assisted by their sister Lizzie (1864-1941) continued to run the drapery business until it was closed in the late 1920s. By that time, Harry, his wife Eliza and their two children had moved to 68 Imperial Road, Beeston and, in retirement, were to move to 3 Newcastle Avenue, Beeston. Harry died in 1941 aged 81, followed by Eliza in 1951, aged 84 9. In 1920, their daughter Gladys had married Maurice George Barton, one of the sons of Thomas Henry Barton, the founder of Barton Transport. Sadly the marriage ended in divorce in 1939 10. Both Horace William and his sister Lizzie remained single and moved to live at 14 Cromwell Road, Beeston following their retirement. After Lizzie's Death in 1941, Horace moved to live at 26 Enfield Street, Beeston, with his younger sister Helen, then a widow following the death of her husband, Thomas Wright Thornhill in 1938 11. Horace died in 1953, aged 82 and Helen in 1950, aged 77 12. John, John and Louisa's youngest child had not been involved in the drapery business. After working as a clerk at a cycle works he later became its sales manager while living with his family at 26 Cromwell Road 13. Like is brother, he also lived with his widowed sister Helen after he became a widower. After the family had left their home and shop at 64 High Road, the property was remodeled to provide three shop units fronting onto High Road, which were numbered 64, 64a and 64b. These are shown in this photograph, dating from around 1960, which shows that the site of the Walker draper's shop had, by now, been remodeled to form two small shops, designated numbers 64a and 64b, then occupied by a photography shop and Betta Baby Wear respectively. Number 64 itself, what had been the Walker house, on the corner of Union Street, was now the site of Clifford's pork butchers shop. This family business had been started by George Clifford in the 1890s. Born in Bramcote, Notts in 1871, he had first found work as a coal miner, probably in Wollaton, where he married Eleanor Barker in 1891 and set up in business as a pork butcher, in Beeston at what was, somewhat ironically, what was then 64 High Road but is now 98 High Road, between Willoughby Street and City Road. Their son, Harold was born in 1891 and, by 1911, he had begun assisting his father in the business. In 1920, Harold married Gertrude Annie Stephenson and began to take over the lead in the pork butchery business which, by then, had moved to 64 High Road and his parents had moved to live at 131 High Road, away from the shop. 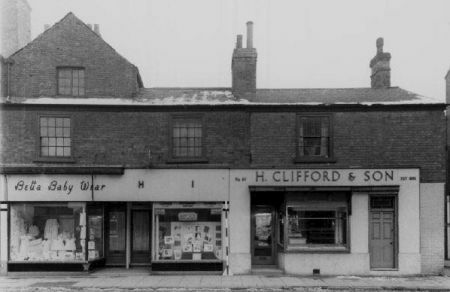 Although, it is likely that Clifford continued to operate the High Road shop, by 1939, he and his family had moved to live at 24b Central Avenue, West Bridgford, Notts, were they ran a confectionary shop. It seems most likely that the shop was run by his wife and possibly his daughter Mavis, who was then aged 18, while Harold continued with the Beeston shop. George died in 1952, by which time, it appears that Harold's son John had joined him at the Beeston shop - which is signed "H Clifford & Son" in our picture from about 1960. Harold, who had moved back to Beeston to live at 11 Cyprus Avenue, died in 1974. 66-70 (previously 32-36) High Road - This part of the frontage that we see in the main photograph, was clearly purpose-built for retail use at street above with living accommodation in the two storeys above - as often as not, in the early years, occupied by the shop-owner's family. Dating it precisely is not easy as, prior to 1891, the properties were not numbered on the records we have. Nevertheless, a degree of continuity in the trades and occupants in earlier years, alongside evidence that Willoughby Street was opened up and started to be developed in the early 1850s, points to the conclusion that this block of shops, as well as the block on the other corner of Willoughby Street, was built in the 1850s. This means that it was already almost 60 years old at the time of our photograph. Early in 1869, it seems that the freehold of each of the three units was offered for sale (see right), although the third one was withdrawn before the sale. Although we are given no clues as to the identity of either the vendor or the purchaser, the names of the tenants and the type of shop offer useful confirmation to census and directory evidence from that era. 66 High Road - this is the property that is clearly shown, occupied by Greenlees as a shoe shop, in the main photograph. This is known to be the position by the time of the renumbering in 1908 but in early years it was occupied as a chemist's shop. In 1861 it appears that George Savage was trading there, described as a chemist and druggist. 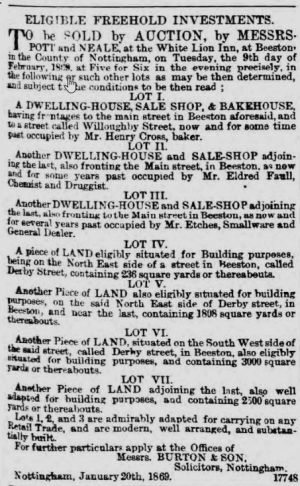 Born in Mansfield, Notts in 1811, he had traded in Mansfield for some years before become, in all probability, the Beeston shop's first tenant. He had married Mary Ann Sanderson in 1841 and they had four children before her early death, aged only 44, in 1849. Although the exact date of his arrival in Beeston is not known, it is likely that it was before March 1860 as it was then that Jane, his second wife, died in Beeston, aged only 53. She was buried in Beeston Churchyard where George was also buried in May 1967 following his death, aged 57. The contents of his shop, together with his furniture were sold at auction in June 1867. The next occupant, also a chemist, was Eldred Faull, born in 1836 in Stokesley, Yorkshire, one of the large family of John Honey Faull and his wife Jane (née Cooper). As a Wesleyan Minister, John Henry moved about the country over the years and Eldred was apprenticed in a large drapery store in Sheffield before taking a position as an assistant to a druggist in Wath upon Dearne, near Rotherham. In 1867, John Henry had been appointed to a supernumerary Minister at Beeston and, it seems. his son took the opportunity of the then vacant chemists shop to start up in business for himself. In the following year, he married Emma Baldry in the Wesleyan Meeting House in Yoxford, Suffolk where, his father had been stationed and where no doubt, the couple had met. In due course, five children - three boys and two girls - were born to the couple in Beeston but, sadly, two of their sons died as infants. One of those who died, their eldest son John Eldred Faull died in February 1876, aged 3, and was buried in Beeston Churchyard. His grandfather, Reverend John Honey Faull, died in the following May, after serving as a Minister for 56 years, and was buried in the same grave. His wife Jane continued to live in Beeston, died in June 1886, aged 84 and was buried with her husband and grandson. Their memorial survives in the Churchyard. By 1890, Eldred and Emma had decided to move on and was by then trading as a chemist and druggist at 66 Church Street, Warrington, Lancashire but, in November 1890, Eldred died, aged only 54 and his widow was left to carry on as best she could. For several years she continued to operate the chemist's shop in Warrington with the help of an employed manager and for a while, it seems, by her son William Henry - but this stopped in 1895 when he emigrated to Canada. By 1901 she and her two daughters had left Warrington and returned to her roots in Suffolk and opened a bookshop in Yoxford, later moving to Southwold where the business continued. Her daughter Mary Elizabeth left to pursue a long career in nursing while Emma Irene stayed with her mother and assisted with the business and, after Emma death in April 1917, continued it in the form of a stationery and newsagents in Southwold. Neither Emma Irene or Mary Elizabeth was to marry and they both died in 1944 within three months of each other. After Eldred Faull and his family had left Beeston, around 1890, the shop became occupied by Arthur Blurton Frost who continued to operate it as a chemist's shop, specialising in surgical hosiery and similar products. Where reference is made to the Probate Calender (Index giving brief details of grant of Probate/Administration), unless specifically stated, the full will and probate documentation has not been seen.